Most of the public’s attention has focused this week on BP’s latest attempt to contain the oil leak in the Gulf of Mexico — the “Lower Marine Riser Package,” or LMRP, a dome that would trap most of the escaping oil and funnel it to a ship on the surface. But even if the LMRP works, it will only be a temporary fix. It won’t be able to capture all of the oil and it won’t stop the oil from spilling. So BP is concurrently working on the most likely permanent solution to the spill — two relief wells intended to intercept the damaged well at its source 18,000 feet below sea level (13,000 feet below the sea floor) to plug up the gushing pipe. That’s a tricky procedure that several experts have compared to hitting a target the size of a dinner plate two miles underground. Relief wells have worked to stop other major offshore oil spills — perhaps most famously the Ixtoc 1 spill off the coast of Mexico in 1979, and more recently the Montara oil leak in the Timor Sea last year. But both of those efforts took longer than originally predicted. BP CEO Tony Hayward told reporters last month that “the relief wells will ultimately be successful.” Three outside experts told the PBS NewsHour they agreed with that assessment, but cautioned that it’s impossible to know how long it will ultimately take to work. The first step is simply drilling the wells to the necessary depth. That’s not difficult, but it does take time. The two wells are being drilled from platforms each about half a mile from the original Deepwater Horizon site. The wells are drilled vertically for thousands of feet and then angle over to the original well. “The drilling is no different than drilling any other well offshore,” says David Rensink, the incoming president of the American Association of Petroleum Geologists. 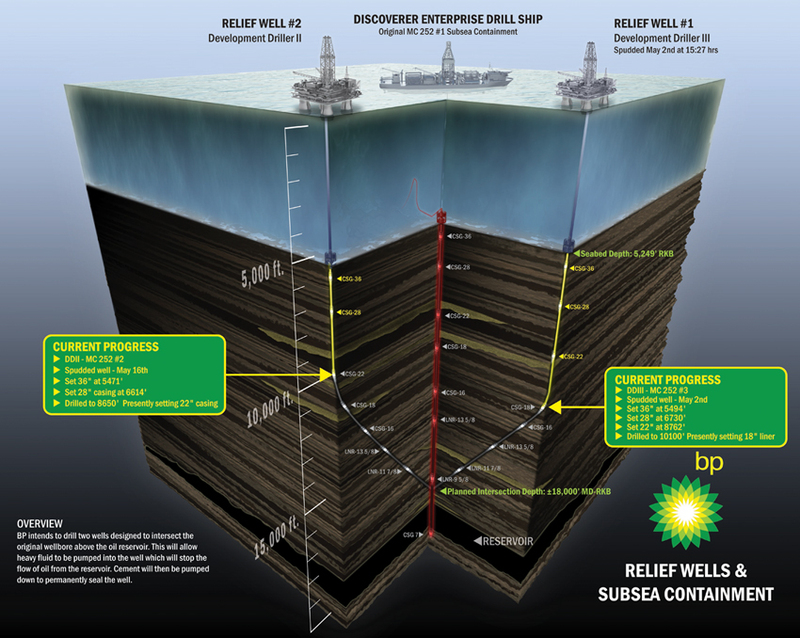 BP began drilling the first relief well on May 2 and the second well on May 16. As of Tuesday, the company said that the first well had reached a depth of 12,090 feet and the second well had reached a depth of 8,576 feet. It has estimated that it will take until early August for the drilling to be completed. The next challenge is to exactly intercept the original well bore, which is only about a foot across. If they miss on the first attempt, they’ll need to back up slightly, plug the hole they just made, and try again. Each attempt could take several days. “If they’re within 20 feet of it, that would be pretty good,” he says. However, each attempt will reduce the uncertainty and get them closer, and Rensink says that he’s “very certain” that the relief well will work eventually. “The reason is that they’re going to keep at it until they make it work,” he says. Once the original well bore is intercepted, heavy mud will start pouring in from the relief well to stop the oil. That will be followed with cement to seal the well. It’s somewhat similar to the “top kill” idea that failed last week, according to Tad Patzek, chair of the Petroleum Engineering Department at the University of Texas, Austin. But it’s much more likely to work, because the relief well will be able to inject the heavy mud directly into the well at a much higher pressure. “With the top kill, it was like you were trying to fight six fire houses blasting out oil with only two fire houses blasting in mud,” he says. *Follow the Newshour’s coverage of the oil disaster and find our Gulf oil tracker widget here*.